For a brief video intro­duc­tion to the pro­gram, click here. Launched in May 2016, this new ini­tia­tive focuses on the increas­ing over­lap of con­flict and cli­mate change, and the poten­tial of renew­able energy as a tool for peace build­ing and con­flict pre­ven­tion. The pro­gram will com­bine research, policy-​​​​based advo­cacy and oper­a­tional pro­gram­ming in conflict-​​​​risk coun­tries. The empha­sis of the pro­gram is on action with three related goals: First, to build stronger links between the com­mu­ni­ties work­ing on con­flict pre­ven­tion and those work­ing on cli­mate change. Sec­ond, to help encour­age the use of clean energy devel­op­ment pro­grams as accepted tools for peace build­ing and con­flict pre­ven­tion, includ­ing through pilot projects in conflict-​​risk or cri­sis set­tings. Third, to high­light the oppor­tu­ni­ties for peace build­ing and inclu­sive polit­i­cal mobi­liza­tion that come from a shared threat of cli­mate change. Cli­mate change is hav­ing a sig­nif­i­cant impact on liveli­hoods and nat­ural resource scarcity, con­tribut­ing to con­flicts in coun­tries such as Sudan, Syria, Soma­lia and Nige­ria. Many of the worst affected geo­gra­phies – in Africa, the Mid­dle East and South Asia — include coun­tries with a his­tory of con­flict. Exist­ing inter­na­tional insti­tu­tions are often siloed in their approach to cross-​​cutting issues such as cli­mate change. Conflict-​​risks are usu­ally met with security-​​first solu­tions, such as peace­keep­ing mis­sions, and the rel­e­vant inter­na­tional insti­tu­tions have yet to adapt to the grow­ing impacts of cli­mate change as a dri­ver of con­flict. Given that the neg­a­tive impacts of cli­mate change are expected to increase, we antic­i­pate the role of cli­mate change as a dri­ver of con­flict to grow, par­tic­u­larly in the most frag­ile states. Though these States are min­i­mally respon­si­ble for cli­mate change and global green­house gas emis­sions, they cur­rently receive only a small frac­tion of the global climate-​​related financ­ing, while often strug­gling to attract out­side invest­ment, and thus are likely to remain vul­ner­a­ble to poten­tially wors­en­ing cli­mate change-​​related cycles of con­flict. Despite this wor­ry­ing trend­line, there is not yet a mean­ing­ful response to these new risks. Renew­able energy pro­vides a unique open­ing for pro-​​peace, pro-​​development invest­ment in climate-​​impacted conflict-​​risk coun­tries. Invest­ment in renew­able energy has dra­mat­i­cally increased and now com­prises approx­i­mately 75% of all global climate-​​related financ­ing. How­ever, the global response to cli­mate change has been over­whelm­ingly focused on the worst pol­lut­ing coun­tries rather than the worst affected: less than 10% of all global cli­mate financ­ing goes to Africa, the Mid­dle East and South Asia combined. Renew­able energy pro­vides a poten­tially pow­er­ful new entry-​​point for peace build­ing by facil­i­tat­ing coop­er­a­tion between con­flict par­ties on an issue, and cre­ates energy infra­struc­ture that is reli­able, clean, scal­able and eas­ily distributed. We have devel­oped three ini­tial mod­els for deliv­er­ing energy/​peace ben­e­fits, in order to help prove the con­cept and demon­strate the poten­tial oppor­tu­ni­ties. We are also work­ing on devel­op­ing a new financ­ing mech­a­nism that is designed to specif­i­cally sup­port the deploy­ment of renew­able energy in con­flict and crisis-​​risk settings. 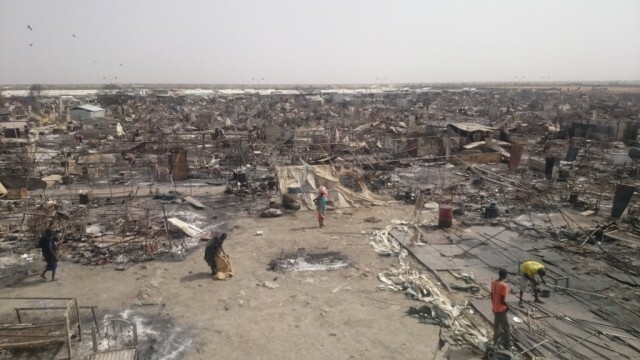 Model 1, Relief camp set­tings: We are launch­ing pilot projects in large Inter­nally Dis­placed Per­sons (IDP) camps in South Sudan, and a clus­ter of refugee camps in Chad and Kenya. Lever­ag­ing the inter­na­tional human­i­tar­ian foot­print, we will demon­strate how a tran­si­tion to solar power in such con­texts can offer both a cheaper energy solu­tion, while build­ing long-​​term energy infra­struc­ture and build­ing blocks for peace for local com­mu­ni­ties. We are also explor­ing the applic­a­bil­ity of this approach in other set­tings, includ­ing North­ern Iraq and Myanmar. Model 2, Inte­grat­ing renew­able energy into peace build­ing and con­flict pre­ven­tion pro­gram­ming: We are part­ner­ing with the inter­na­tional NGO Non­vi­o­lent Peace­force, a leader in unarmed civil­ian pro­tec­tion, to test this model through pilot projects in South Sudan and Myanmar. Model 3: Renew­able energy as a peace div­i­dend strat­egy: We are pro­mot­ing the use of a renew­able energy as highly vis­i­ble, quick impact and mean­ing­ful tool in the peace div­i­dend toolkit – which seeks to deliver devel­op­ment gains to help sup­port recently con­cluded, or soon-​​to-​​be final­ized peace agree­ments. We are explor­ing the applic­a­bil­ity of renew­able energy to sup­port local agree­ments in Cen­tral Nige­ria, and at the national level in sup­port of Myanmar’s peace process. Peace Renew­able Energy Credit (PREC): We are devel­op­ing a new financ­ing mech­a­nism specif­i­cally designed to sup­port renew­able energy invest­ment and deploy­ment in con­flict and cri­sis risk set­tings. The PREC will help address some of the financ­ing chal­lenges unique to these set­tings, in order to help draw a greater share of global renew­able energy invest­ment to the places that need it most. Under the over­all lead­er­ship of Dr. Dan Kam­men, the found­ing direc­tor of RAEL and pro­fes­sor of Energy, our team includes experts in renew­able energy and cli­mate change, as well as con­flict pre­ven­tion and peace building. David Williams was selected as one of Time Magazine’s Inno­va­tors of the Year. He has been an advi­sor for US Depart­ment of State, merit reviewer for the US Depart­ment of Energy’s Sun­Shot pro­gram, tech­ni­cal reviewer for San­dia National Lab­o­ra­tory, solar advi­sor for USAID, and con­trib­u­tor to National Renew­able Energy Lab­o­ra­tory. Mr. Williams has been involved in devel­op­ing renew­able energy projects in the Caribbean, Amer­i­cas, Europe, Mid­dle East, Asia and Africa. Sher­win Das most recently served as the Chief of Polit­i­cal Affairs for the United Nations Regional Office for Cen­tral Africa. He has designed and imple­mented con­flict pre­ven­tion and peace build­ing strate­gies, poli­cies and pro­gram­ming for the UN Depart­ment of Peace­keep­ing Oper­a­tions, the UN Depart­ment of Polit­i­cal Affairs and the United Nations Devel­op­ment Pro­gramme in the Balkans, East­ern Europe and Africa. Fol­low­ing a stint in the UN’s Medi­a­tion Sup­port Unit in New York, he served as the UN’s Peace and Devel­op­ment Advi­sor in Moldova. Alex Thier is a lead­ing thinker and pol­icy maker on inter­na­tional devel­op­ment, poverty reduc­tion, and inclu­sive growth. As Founder and CEO of Triple Helix, Alex is work­ing with a vari­ety of orga­ni­za­tions on expand­ing renew­able energy access, strate­gic plan­ning, and address­ing frag­ile states. As a senior U.S. gov­ern­ment offi­cial from 2010 to 2015, he led inter­nal and exter­nal policy-​​making, reform, and imple­men­ta­tion for USAID rep­re­sent­ing the U.S. gov­ern­ment at the high­est lev­els of inter­na­tional engage­ment on devel­op­ment pol­icy and finance and man­ag­ing a $10 bil­lion+ port­fo­lio of pro­grams. He played a lead­er­ship role in the cre­ation and imple­men­ta­tion of sev­eral major US and inter­na­tional ini­tia­tives, includ­ing the Vision to End Extreme Poverty, the Sus­tain­able Devel­op­ment Invest­ment Part­ner­ship, and Power Africa. Alex has held lead­er­ship posi­tions in the UN, Stan­ford Uni­ver­sity, USIP, and sev­eral NGOs. He’s authored and co-​​authored books, arti­cles, and op-​​eds in The New York Times, For­eign Affairs, and For­eign Pol­icy, and appears fre­quently in inter­na­tional media. Elliott Don­nel­ley is a Found­ing Gen­eral Part­ner of White Sand Investor Group, LG, a fifth gen­er­a­tion invest­ment part­ner­ship of the Chicago-​​based RR Don­nel­ley fam­ily. In this role, he has increas­ingly focused on the nexus between invest­ment for finan­cial return and invest­ment for social and envi­ron­men­tal impact. Elliott is an advi­sor and/​or co-​​founder of a num­ber of ven­tures, includ­ing Ethic Inc., My Bliss, The China Phil­an­thropy Forum, and KD Ven­ture Part­ners. He is also on the boards of trustees of Syn­er­gos and the Phil­an­thropy Work­shop, and on the board of Stanford’s Global Project Cen­ter, where he pro­motes research on inno­v­a­tive mod­els in phil­an­thropy and impact invest­ing. Elliott is a grad­u­ate of Yale Uni­ver­sity and spent years liv­ing and work­ing in Bei­jing, where he still has strong ties in the phil­an­thropy and impact invest­ing industries. Dr Youba Sokona has over 35 years of expe­ri­ence address­ing energy, envi­ron­ment and sus­tain­able devel­op­ment in Africa, and has been at the heart of numer­ous national and con­ti­nen­tal ini­tia­tives. He coor­di­nated the scop­ing, fram­ing and devel­op­ment of the “Africa Renew­able Energy Ini­tia­tive”. Reflect­ing his sta­tus, Dr Sokona was elected Vice-​​Chair of the Inter­gov­ern­men­tal Panel on Cli­mate Change (IPCC) in Octo­ber 2015. Prior to this, Dr Sokona was Co-​​Chair of IPCC Work­ing Group III on the mit­i­ga­tion of cli­mate change for the Fifth Assess­ment Report after serv­ing as a Lead Author since 1990. In addi­tion to these achieve­ments, Dr Sokona has a proven track record of organ­i­sa­tional lead­er­ship and man­age­ment, for exam­ple as Inau­gural Coor­di­na­tor of the African Cli­mate Pol­icy Cen­tre (ACPC) and as Exec­u­tive Sec­re­tary of the Sahara and the Sahel Obser­va­tory (OSS). Dr Sokona’s advice is highly sought after, and as such, he is affil­i­ated with numer­ous boards and organ­i­sa­tions, includ­ing as a Mem­ber of the Board for the Insti­tute of Devel­op­ment Stud­ies, as a Hon­ourary Pro­fes­sor at the Uni­ver­sity Col­lege Lon­don (UCL), and as a Spe­cial Advi­sor to the African Energy Lead­ers Group.